Ensure that the raw materials for your food such as fruits, vegetables, and grains are farm-fresh and cultivated using organic means of farming. Less use of pesticides means the food is chemical-free and healthy too. Stress on cleanliness. Wash hands properly before cooking meals. Also, eat only after thoroughly washing hands. Store raw and cooked foods separately. Mixing them can accelerate food spoilage. Cook perfectly. Various microbes are killed if the food is cooked thoroughly. Hence, do not cut out on cooking time, especially while cooking non-vegetarian dishes. Store food at the required temperature. Food stored at proper temperature is likely to have more shelf-life as well better retain its nutritional value. Hence, store intelligently for ensuring food safety. Good habits begin at home. 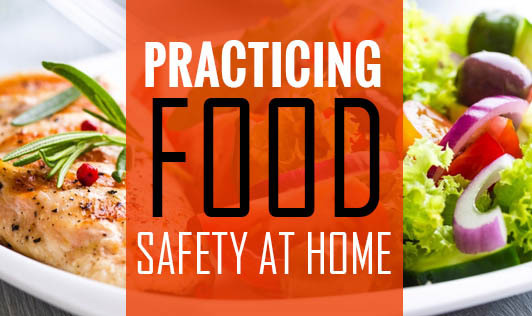 Do your part to ensure food safety at home and other people will follow. Let’s make the world a better place by ensuring that healthy food reaches one and all.